MPs pocketed 10% payrise while Department of Works and Pensions report shows over half of Britons have been cutting back on food. "Our teachers, doctors and armed forces do a wonderful job serving the people of this country. Pay restraint has been very difficult for many, but has helped us to protect vital public service jobs while we deal with Britain’s deep financial problems. The independent pay review bodies have worked hard to bring forward a balanced and affordable set of recommendations that delivers on our commitments to increase pay by around 1% and deals with particular pressures. The government is grateful for their work and I am pleased that we are able to accept their main recommendations. Happily for some the doom and gloom did not spread everywhere. 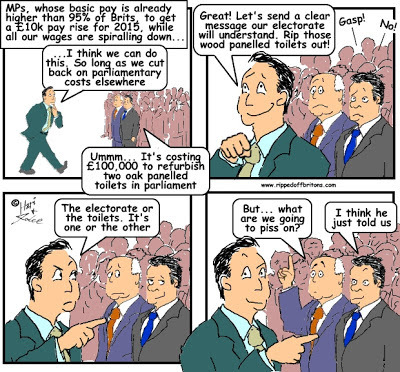 From 31st July 2015 MPs pocketed a 10% payrise, their pay going up from £67,060 to £74,000 per annum (backdated to the General Election in May 2015). Perhaps you remember all those MPs shaking their heads and shooting out their lips protesting that the payrise was a disgrace in these times of austerity? According to the website Donate My Payrise 74 out of the 650 MPs pledged to hand over the extra cash to charities. The website helpfully gives links to the individual MPs’ public statements, so you can check what your MP did or didn't say. A report in October 2015 by the Sun newspaper stated in fact only 26 MPs had actually done so. [Subsequent to the Sun report the SNP chimed in saying their MPs too would donate their rises to charity, but hadn't at that time decided to which ones]. "Q12. Stephen Pound (Ealing North) (Lab): will [the Prime Minister] tell the House whether he will personally benefit from the millionaires’ tax cut to be introduced this April? The Prime Minister: I will pay all the taxes that are due in the proper way. " Could it be Cameron, Starbucks and Google share tax advisors? Surely not! Duncan-Smith, thoughtful chap that he is, waited until the day MPs broke up for Christmas holiday, on 17th December 2015, before publishing the report. So as not to spoil their mood as they scampered off to spend their 10% payrise on presents and other festive stimulants. You can't say our Government isn't sensitive and caring. 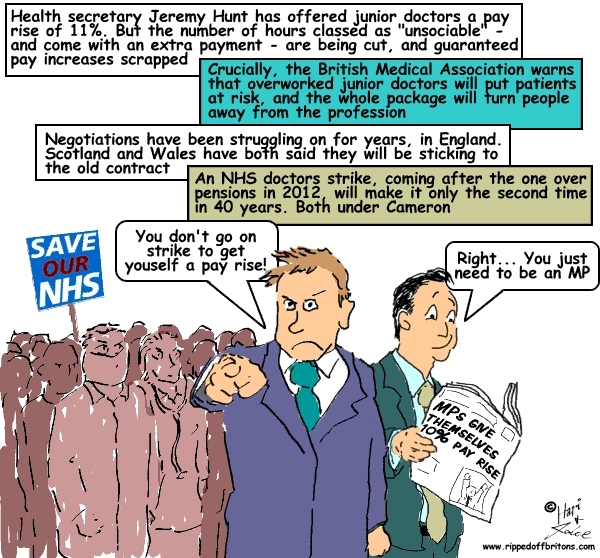 Achingly difficult to recommend :government should pay everyone what they are worth. Government sit high in their ivory towers, but don't do anything much,(apart from causing pure misery to all citizens. Basically, if MP's are worth so much money for speaking at PMs question time, and merely push their pens around all day the rest of the time, then surely Doctors/Junior Doctors, working hard all day long, must be worth £1000's for saving lives?